and 2 used ones to add to the comparison. This post does not only share my test results, but hopefully also guides you in the sail for compatible spare battery for Jolla Phone. Unfortunately I didn't run into one 100% compatible yet - but on the other hand, even a new official Jolla battery failed on one test. There are also related safety issues, so please read before starting your own tests. Are there any compatible batteries for Jolla Phone? Disclaimer: Jolla does not suggest using any other than official Jolla batteries on Jolla Phone. Instead they are warning about possible dangers to both the user and to the phone. Even that the batteries introduced in this post fit into the phone and meet the specs in paper, there are differences which might affect on usability, safety and hardware functionality on the phone. Test on your own responsibility. After that said, well, you know I wouldn't write this if there were supported spare batteries available somewhere. I've followed the problem for a while, and even that some Sailors have been helpful, it was never enough to find one. So I put up this amateur test. Ok, I'm still standing and I HAVE all my hair. I almost lost a few while browsing through 160 000 lines of logs. Also, I'm still looking for a spare battery. I hope my post helps you in your tests, please comment if it did or not. The two "compatibles", Polarcell and Gold, are exactly right sized and have the correct voltages (3.8V / max 4.35V) in their specs, giving an idea they might be at least safe to try. Safety in charging: I started with charging all batteries full, following the process via SSH session (Linux terminal, command "upower --monitor-detail") and using external meter for voltage, checking if the values on phone would match (they did not, but they were close enough regarding safety). I kept an eye on the surface temperature too. And to be sure: I let the fully charged batteries to cool down, leaving them in room temperature for four days (96 hours). This way I wanted to make sure I start with 5 comparable batteries, all the chemicals and electrons are "settled down" and temperatures exactly the same. All my tests took place in room temperature. External meter "Powerfix Profi". I used it for voltage testing, plugging it to battery pins of the phone with two thin wires. *Display can be forced on with terminal command "mcetool --set-demo-mode=on". Mce tools can be installed on Jolla with command "pkcon install mce-tools". Note on conditions: I planned this test considering normal usage pattern of a spare battery: Sometimes left staying fully charged, sometimes changed into the phone. For this purpose I always started the discharge tests from reboot and put the apps running before starting logging. This way, my capacity results are hopefully close to the actual usage pattern of spare batteries. The two new batteries were charged only once since they arrived. The new official Jolla battery has been waiting on my shelf for almost 9 months, so it had already lost some of the factory charge, and maybe some potential as well, but for that this was only the third charge. Two "compatibles" were fresh arrivals. The used Jolla batteries are both used for 20-21 months in two different phones. Green values are taken in the very end of charging, charger connected. Red values are after later discharge. All the five batteries started to charge ok.
First problem found was that SoC (Qualcomm) in the phone didn't give correct readings for temperature for either Polarcell or Gold battery, and also the voltage reading differed, within the error limits for all other batteries, but way off with Gold. I assume that the Gold battery was the only one which Jolla didn't manage to charge fully. Charging of that ended between 86% - 89% battery reading on Jolla, and also the external voltage meter confirmed it was not even close to full. Charging test ended with measuring the exact voltages from each battery taken out of the phone, then leaving them for four days and measuring the voltage again. Safety note on charging: Do not test unknown batteries without monitoring the temperature, and do the testing in safe place. Make sure the battery specs meet the requirements (3.8V / max 4.35V) and that the battery has a safety circuit preventing overcharging. Jolla's metering seems to be tuned for official Jolla battery, and any other batteries might give wrong readings for voltage and/or temperature, in the worst case overcharging a battery. In my test I didn't run into overheating or overcharging with any of the batteries tested. During 4 days of rest, none of the batteries had lost remarkable amount of energy. Before the discharge I checked the voltages with an external meter, and the loss compared to freshly charged batteries was typical, from 4.25V to about 4.20V. Gold had different loss, metered from fresh 4.09 to 4.02V after the "rest"
The best: New official Jolla battery (blue curve) was able to run these four apps on full screen brightness for almost 5 hours. It shutted down just 4 minutes before reaching that "milestone". Please test with your phone, if you can arrange the same conditions. Quite close: Polarcell "compatible" didn't loose by many minutes, but note the differences on voltage readings in the phone (unsteady yellow curve). By the way, the external charger showed much more steady readings (variance 0.3V) during the whole discharge, suggesting... what? 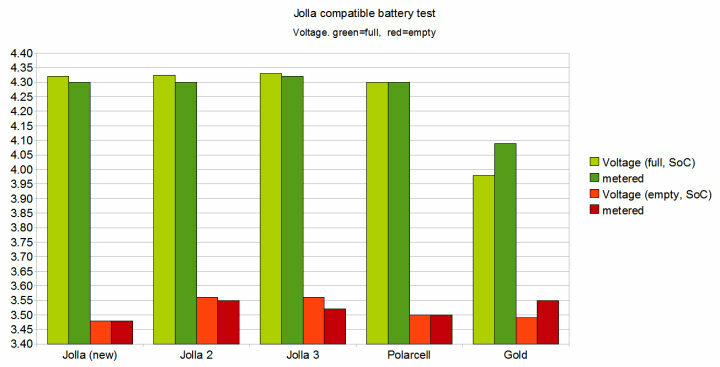 Used Jolla batteries (green and red curve) were steady on Jolla's internal metering, but both of them caused on automatic shutdown with higher voltage than any of the new batteries. The phone turned off when they reached 3.56V, percentage still showing 2% like for all the others. This might simply relate to the loss in capacity, Jolla leaving this way enough of emergency spare into the batteries. Notes on discharge test: Jolla uses trigger values to stop charging and to shut down the phone. Unsteady readings might trigger these actions earlier. Pick your batteries from quality manufacturers to avoid any loss in battery life because of this. As I mentioned earlier, either Polarcell or Gold couldn't deliver correct temperature readings for Jolla phone. This is probably caused by different temperature chip on the batteries, not readable by current software on Sailfish OS. This is a safety issue, as any smartphone should be able to slow down it's processing, and even shut down, based on too low/high battery temperature. On these two batteries (Polarcell, Gold) Jolla seems to have no idea how warm they are. 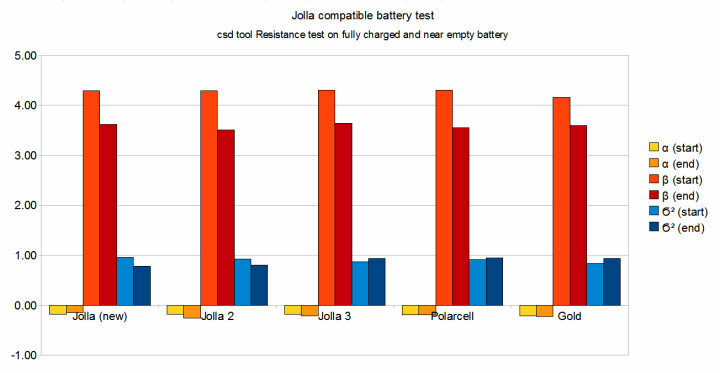 Resistance tests were performed using Jolla Phone csd tools for diagnostics. Tool can be launched simply by writing "csd" in terminal. I tested all batteries in their maximum charge, charger unplugged, and in their minimum charge just before automatic shutdown. I disconnected the external meter during these tests, as it would affect on the resistance if kept connected. All five batteries did quite well on this. To my surprise, the new official battery failed in the test after its first full charge. I wasn't nearly as surprised when the Gold failed later, when it was very close to empty. But both these batteries failed only by a bit. Instead of traditional "specs capacity" (blue), let's see how much energy each of the tested batteries can actually deliver to the user (red). Now before going into that, please note that smartphone batteries are not designed to deliver their full specs capacity. Typically there's about 20% of spare capacity left for emergency use, allowing for example long emergency calls with seemingly empty battery, or keeping an empty battery alive when stored. Another 0% to 20% (to even more) is reduced by time and use. This is most visible in my two used Jolla batteries, but might have some affect even on freshly delivered batteries. Let's start from the worst... Gold reports capacity of 2450 mAh in its specs. Jolla was not able to charge it full, and the usable capacity was left to 1538 mAh (63%). Also in my test, Gold battery delivered 20kJ of energy for the bright display and the four apps in just 3 hours and 9 minutes. Jumping voltage readings might play a role on such bad battery life, but the true capacity remains as a secret as the battery was never charged full. Jolla 2 - my own battery has seen some consumption during 21 months. It was still capable to run those apps and keep the display on for 4 hours and 2 minutes, delivering 1285mAh (61% of specs). Consumption was much lower compared to Gold battery, so this used Jolla battery beat the Gold in battery life even having less capacity. The best. The one we want. New official Jolla battery managed to reach 1522mAh (72%). That's less usable capacity than what Polarcell had, yes, but the steady quality kept the consumption down, leaving Jolla to run those apps for almost full 5 hours. Why doesn't a new battery deliver all of its designed capacity? I'm supposed to have 5 batteries left now, with only the emergency energy in them. I'm afraid to test the amount of that energy, as I might kill the batteries. Voltages on the empty batteries vary, and I can't be sure how much my Jolla has left for each. Haha, this really makes the whole capacity topic quite unreliable, added by the fact that Jolla didn't read voltages right on all the batteries. But at least the results are directional, I hope. Just forget it. Cat's gold. Polarcell - Not 100% compatible due to missing temperature readings. Build quality seems decent, but not as good as the official batteries, looking at those slightly jumping voltage readings. This battery shows very high usable capacity (3%-5% larger than official battery), but also about 8% higher consumption, in the end resulting as slightly shorter battery life compared to a new official battery. Would I recommend? For careful use, knowing about the missing temperature, ok for temporary need I guess. Is it safe? Well, I do trust at least on the safety circuit on this battery. If I had to take a spare for travel, it might be this, while no better options have been found yet. Official spare - Yes please! But where and when? I've heard that Jolla is nowadays a software company. Vote on TJC. Contact them. You know. They do listen. Other options - The hunt goes on. For safety reasons I'd love if someone runs into a battery with the same (or supported) temperature chip, or Jolla's Sailfish OS to be updated to understand Polarcell's chip as well. Would be nice! Calling Sailors for both options - they should know the chip at least. How did I get a new Jolla battery? Temperature reading in Jolla batteries is carried out by a thermistor having a nominal (25 °C) resistance value of 10 kOhm. Surely both Polarcell and gold batteries have a resistor instead of a thermistor, so they will always read about 25 degrees. I have been running a "self-built" battery with no thermistor in my Jolla for one year without ever having problems. 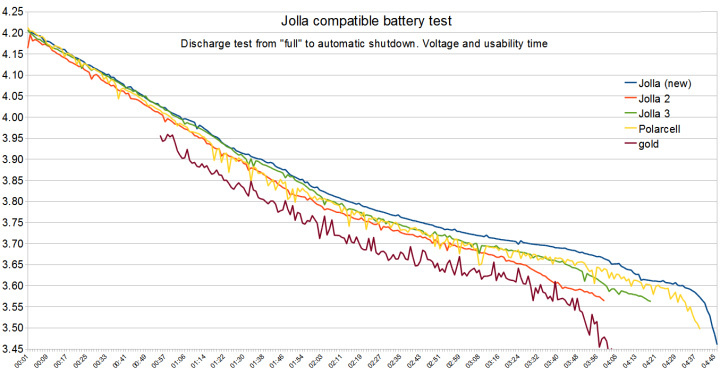 Degraded performance in used Jolla batteries is not due to less charge storage capability but rather to increased output resistance (alpha in the test bigger in magnitude), leading to lower output voltage when loaded and therefore reaching the shutdown voltage earlier. Thanks you guru :) Now where would we find aa correct speced battery with thermistor then... Manufacturer contacts needed? Used it for two month now, works great, can use the phone for two days straight at least. Could you solder the PCB from the original Jolla battery to the Gold one to be able to fully charge the Gold battery and messure it's capacity aggain? if the problem of temperature is only in office, we can use a battery charger from the wall ... so we do not charge the battery with our smartphone. Has Jolla sailors been contacted fir thus issue (adding support for polarcell in the OS? If so, is there thread about this issue in TJC? Couldn't find one myself except about battery itself. Why the Jolla phone cannot operate without battery present while other phones can ? When i plug in USB cable between Jolla phone (without battery) & PC i cannot access the phone to view the data in it or use the phone to call as such ! What solution exist to be able to use the phone via USB power temporary without battery ?